I caught the train to Wahroonga, not knowing exactly what to expect I then cycled to Cliff Oval/Reserve. Despite a few wrong turns I arrived on time and met up with the group as they arrived. Excluding the trainers, most of the guys where from the induction walk. We started off with a sort of tug-a-war exercise where a side was either lifting or lowering whilst the other side was performing the opposite. The idea was not only to practice lowering and lifting, but also to compare the different building blocks as well as the new and old equipment. When both lowering and hauling, redundancy is (now?) 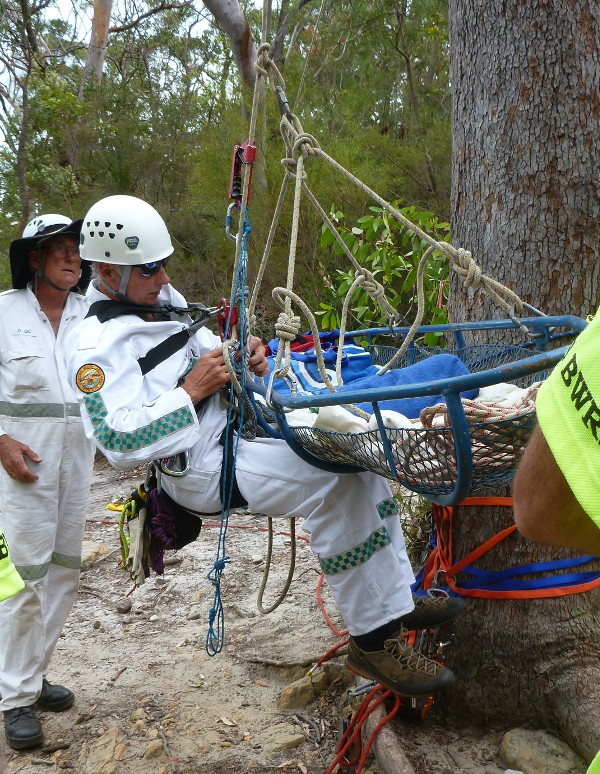 required in a rescue operation this means that there always needs to be two ropes attached to the load. 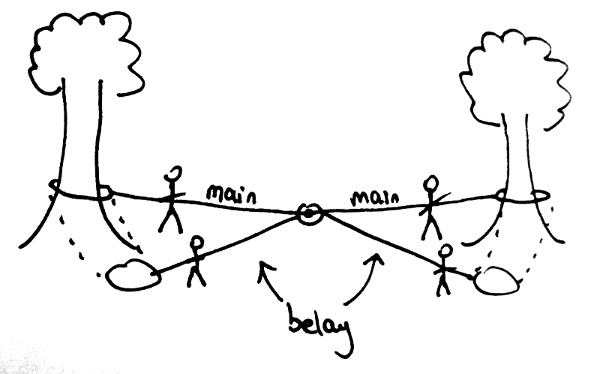 This way, if the main line fails, the second will take over. The below examples do NOT include the redundancy line. 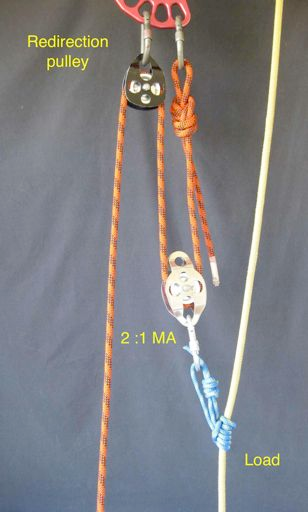 When lowering, the older system used a Whale’s Tale (or Golden Tail) as the top-belay device. 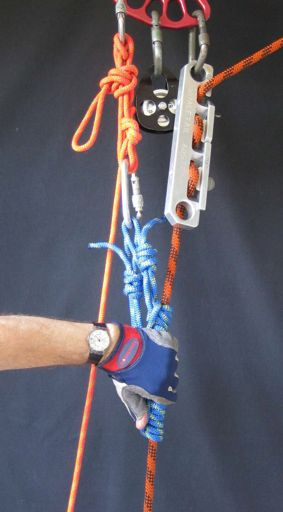 Tandem prussiks can be employed directly below the descender to act as a fail-safe should the operator become incapacitated. The prusicks need to be released in the event they grab. 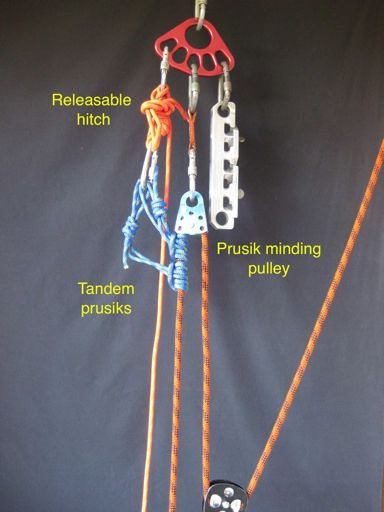 The figure on the left is using a reversible brake (in this case a Whale Tale) as the method of taking the load off the prusiks, whilst the figure on the right is using a releasable hitch. 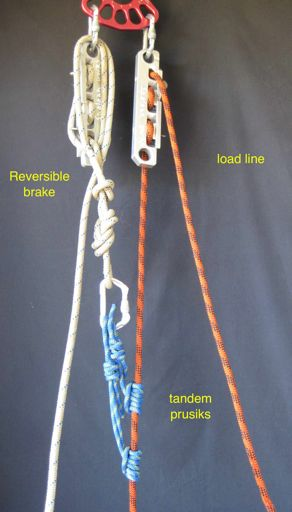 A single operator can man both the load line belay and tandem prusik brake (but it is easier to have two). Note that on the right a breaking crab has been added to introduce more friction. 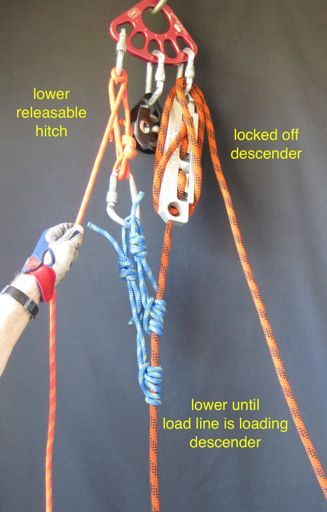 An alternative to prusiks is to use a U-type rescue rated ascender such as a Petzl Rescuecender. 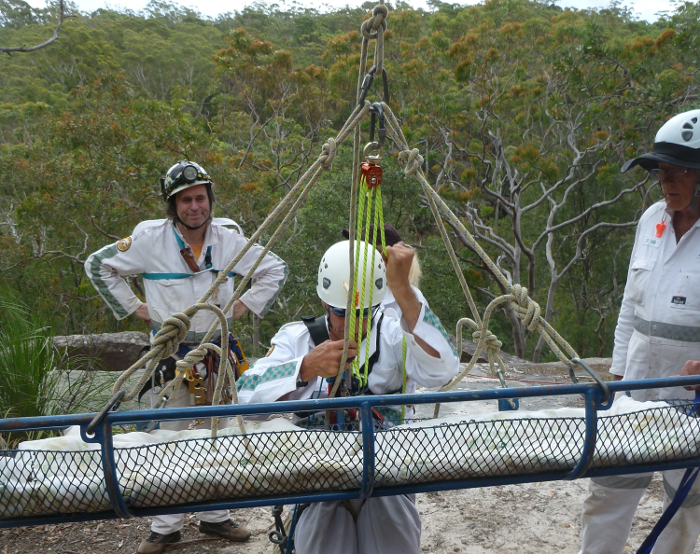 When lifting mechanical advantage (MA) is required. MA is constructed changing the ‘d’ in the work equation” W=F.d. By increasing the distance pulled relative to the load we reduce the amount of force we need to apply. Below are a couple of examples. 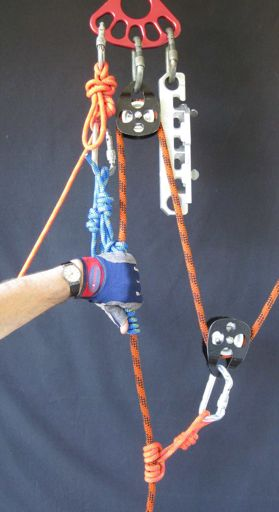 Once the attachment point comes close to the lifting system (as in the examples shown) the attachment point needs to be reset. 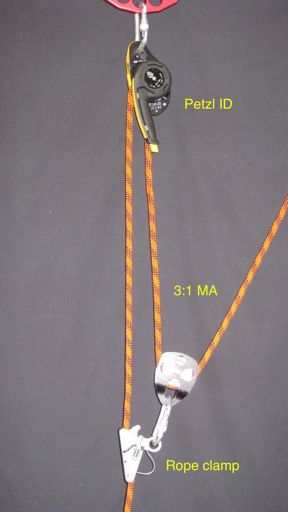 On the right is an example of 3:1 MA – note that the tandem prusicks act as a progress capture device (PCD). This means that when the lifting team stop hauling (for example when they need to reset) the PCD will take the load. Stop hauling. Ensure the PCD (Tandem prusiks) are engaged. Commence lowering. PCD may remain in place and is kept slightly open to allow lowering. Modern devices incorporate both descender and PCD. Below is a comparison between the building block and Petzl ID systems. Both provide a 3:1 MA but the Petzl ID makes the system more compact and easy to manage. Another device that we used was the MPD which is much more efficient than the ID (see day 2 for pic). After some lunch we put these systems into practice lifting and lowering each other. The second day’s training spot was also in Wahroonga, but this time on Browns Road. 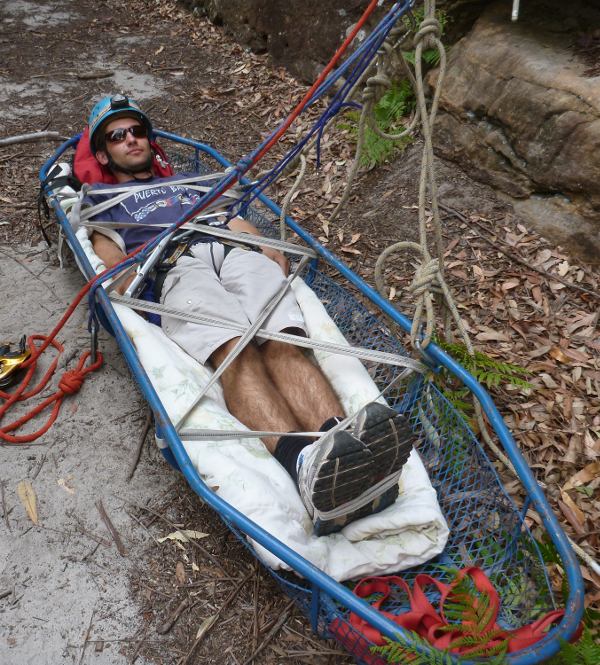 The second day built on the first by introducing a stretcher. 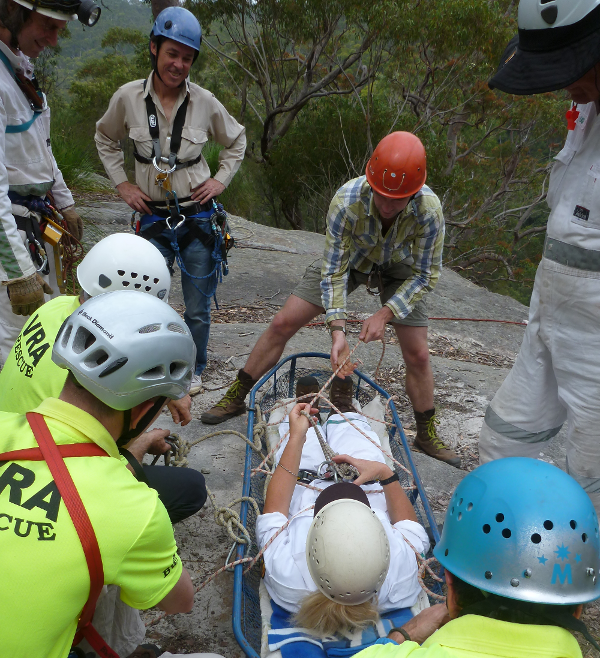 The idea was to simulate a possible vertical rescue situation. After rigging a few lines, a rope was thrown over a tree branch and a demonstration of out-riding and in-riding was given. We were shown a system using regular hand ascenders and another using the Rock Exotica Aztek system. We also went over how to secure a person/patient into the stretcher so that they won’t tip out if the stretcher angle becomes precarious. This involved securing the feet and creating a webbing out of a long piece of tape. I found being team leader one of the most difficult positions as you couldn’t focus on any particular position, and yet had to be aware of them all and coordinate. I also found that the Team Leader didn’t have as much of a role when the edge manager was in close proximity to the other stations. Lowering and Hauling were quite easy positions, manning the belay line was a little trickier as I had trouble keeping the slack out of the rope, I think this was just due to lack of experience with the ID. Out-riding and In-riding was quite fun. 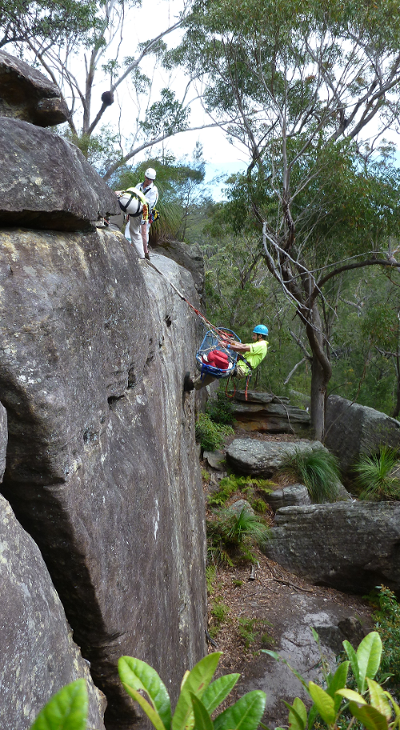 I found that on this cliff In-riding suited me much more because when out-riding my legs were too short to keep the stretcher off the cliff-face. I learnt a lot over the weekend and look forward to the next weekend.